House Vilana is a newly built holiday home located in a small village Brscici near Svetvincenat. It is approx. 15 km from Fazana, where are lot of restaurants, beach and grocery shop. From Fazana several times a day the boat departs to National park Brijuni. 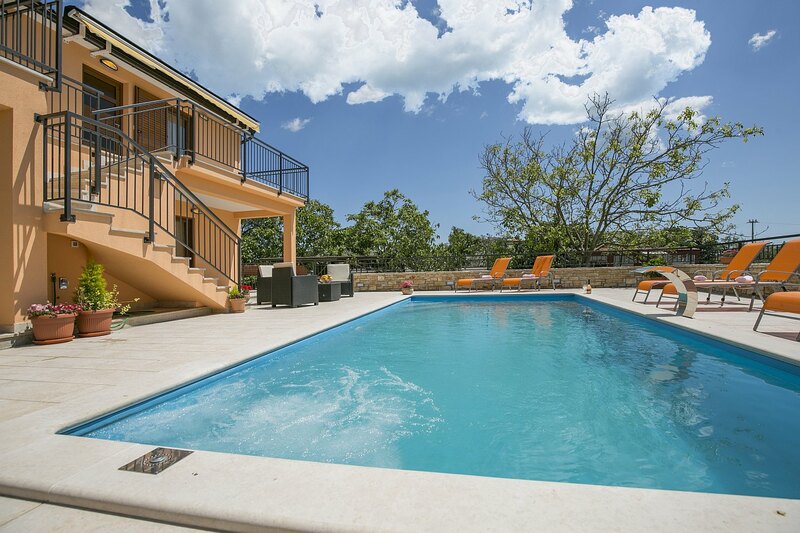 The house is located on its own enclosed property of 540 sqm and provides to its guests an outdoor swimming pool of 30 sqm, garden furniture, barbecue and 4 parking spaces. Holiday house for 12 persons with a total living area of 187 sqm, is located on two floors and connected with an external staircase and with an identical layout: living area with a dining table and exit to the terrace, fully equipped kitchen, two double bedrooms with their own shower/toilet. Following the corridor on both floors there is one more double bedroom with its own shower/toilet and exit to the terrace, a kitchenette.